Today was bright sunny day in Milan, the fashion city of Italy and the world. So I walked by the Cathedral (duomo) area to Cordusio around Via Dante, an area near to the Cathedral of Milan, Duomo Milano, reachable within 5 minutes walk. This via dante is full of big main industries and shops like TIM Italia for the mobile provider, Uni Credit Bank and also one of the famous theatres in Italy, Piccolo Teatro. 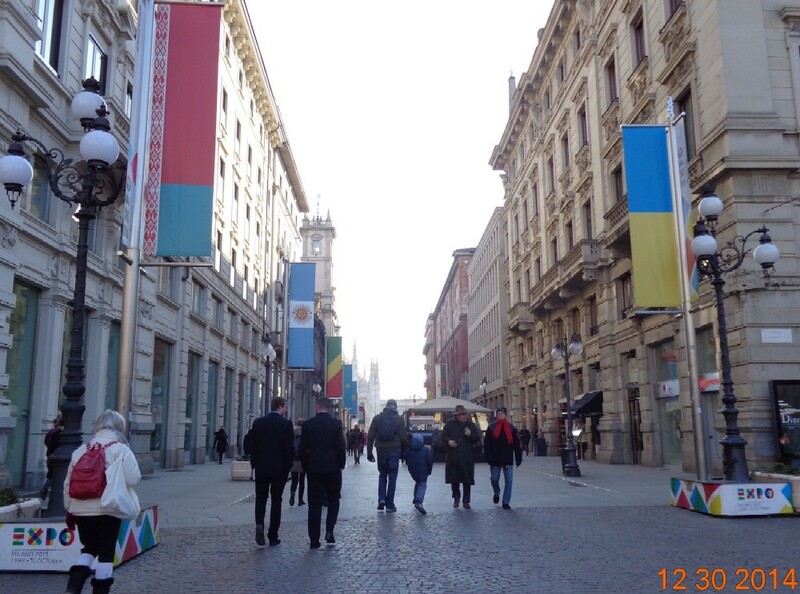 During the last two years from around 2012 if I’m not mistaken, I always see the various countries’ flags exhibited along the road from Duomo & San Babila to Cordusio, Via Dante. Why are these flags shown? It’s simple. As the huge event of universal exposition will be held here in Milan within the next 4 months from May 1 to Oct 31, 2015, this is to express the participating countries of the historical event that will host around 147 participants in it including the international organizations like European Union and United Nations. Approaching the event, lots of construction and development are being built. The full site of the event itself at Rho Fiera Milano, which is the official exhibition site of the city for many exhibitions, is now having its busy days to develop the complete location of Expo 2015. Furthermore, the public transportation system of the railway and underground subway are also being improved in many areas to be ready to welcome the big event. It’s to make sure that the visitors will have smooth movement from one area to another in the city of Milan. As we know, the Expo 2015 will hold the global theme, “Feeding the Planet, Energy for Life”, which is very significant to bridge the talk for solutions in the future for this important issue. Why is it important? Well, to start, we are living in a planet of 7 billion people in which around 800 millions of us are still suffering from starvation and drought as the nutritious food and clean water access are still difficult to have. Moreover, it is predicted that the world population will have increased to near 9 billion by 2030 and exceed 9 billion by 2050. I suppose the Expo 2015 will be crucial to discuss about the food supply and distribution issue to cover the needs of all of us. Additionally, the discussion and ideas will come not only from one country or continent, but it will come from the whole world in various cultural diversities, making them thorough and more complete as different values and traditions will be expressed. The ticket sale has been started since the last few months with adult single ticket is priced at €27 for a fixed date and €32 for a later decision date (not fixed). If we come in a family of four with 2 parents and 2 children, we can buy the family package that costs €82 in total. For school visits with at least 15 persons in a group will also enjoy a reduced price of €10 each with an adult to accompany for free.